The EPA is reportedly planning to release a list of potentially dangerous chemicals and neurotoxins in early 2011. 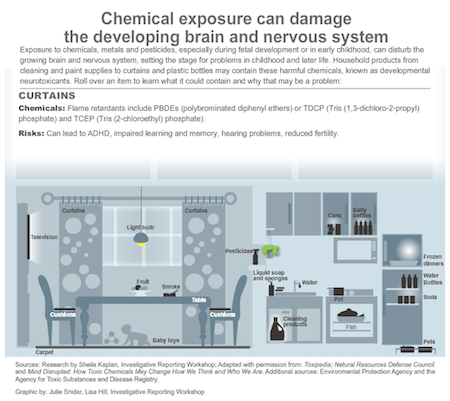 The current roster is the result of a three year effort to determine which chemicals pose the greatest risk to human health. Many of the chemicals on the list are found in everyday household products, drinking water and lawn are garden products. With the rates of neurobehavioral disorders, autism and learning disabilities increasing beyond what is expected with increased diagnoses alone, it’s time to bring awareness to this issue. Under the Toxic Substances Control Act companies are currently allowed to put many chemicals on the market without first proving their safety…as we found out just last week with the Honeybee killer, clothianidin. As a result there are currently thousands of chemicals on the market of which we have little or no understanding. Edward Levin, professor of psychiatry and behavioral science at the Duke Institute for Brain Science, told Shiela Kaplan, “Behavioral toxicology is a field defined as a race to figure out what’s going wrong and how to deal with it before we’re too stupid to care.” Scary.